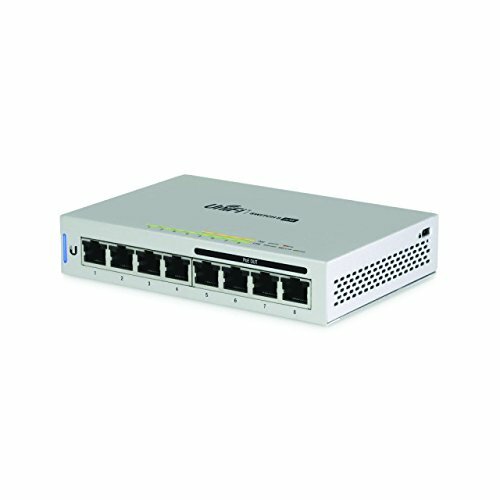 The US-8-60W is an 8-port gigabit switch with four 802.3af Poe ports. Its auto-sensing Poe ports deliver up to 15.4W of power per port. The US-8 is a Poe Powered 8-port gigabit switch with Poe Pass-through. Perfect for cleanly adding Ethernet ports where needed, with pass-through to keep your Poe device powered. Non-Blocking Throughput The new 8-port models feature Gigabit Ethernet ports in a compact form factor. For its total, non-blocking throughput, each UniFi Switch supports up to 8 Gbps. Switching Capacity The UniFi Switch offers the forwarding capacity to simultaneously process traffic on all ports at line rate without any packet loss, with a switching capacity of 16 Gbps.